I would add for those of you interesting in mimetic theory that the story “Buyer of Hearts” is filled with mimetic issues in the junior high and the town beyond. You can read this review in its entirety on the From Beyond to Here page. You can also read “The Ghost of Swiss Castle” as a sample of my writing. I hope this review encourages more readers to give my stories a try. For some comments on ghost stories in general see Chills and Salvation. Sometimes the first inspiration of a story comes from an unplanned, surprising source.Here is one of the more unlikely and unexpected inspirations. While visiting a family in the Chicago area that I am very good friends with, the boys wanted to go to the neighborhood park, so their father and I took them. Among the play equipment there was a cylinder-shaped piece shaped like a castle’s turret with large holes in it to facilitate climbing all up and around it. The boys told me they call it Swiss Castle because the holes made it look like Swiss Cheese. I instantly realized that Swiss Castle had to be haunted. From there, I got the image of a hideous mansion on Lake Shore with huge round windows making the facade look like a hunk of Swiss cheese so the mansion was called “Swiss Castle” by its detractors. Why windows like that? Well, the first floor was abnormally high. Why? Because there was a pipe organ in the living room? Like the Cheese Castle in the playground, this house had to be haunted. Would nice people live in a house like that? The woman who played the organ was a loving person but she had been dead for years and the couple who lived there were about as affectionate as a couple of posts. A couple like that needs to have a pair of children they don’t want come to visit them for a year because their parents don’t want them tagging along with them to Copenhagen. Two hurt and angry children plus one hurt and angry ghost leads to some interesting situations with a hope of redemption. (See blog post Chills and Salvation) When it came to publishing the story in my collection From Beyond to Here, I decided to change the title to “The Ghost of Swiss Castle” because I thought calling it Cheese Castle was—well—too cheesy. If a fantasy story with a ghost might possibly interest you or somebody, young or old, whom you know, please give The Ghost of Swiss Castle a try. For many in North America, Halloween is a day for children to dress up, have fun, and get lots of candy from indulgent neighbors. Skeleton suits and witch’s makeup are all in fun. Not as fun is the background to Halloween that goes back to rites, such as the Celtic Samhain festival, designed to allay anxiety over blurring the distinction between the dead and the living and make sure the dead stay dead. This anxiety causes some people to try to suppress modern Halloween, although the people who sentenced witches to burning should be more horrifying than girls running about in black dresses with candy bags. Blurring distinctions between the living and the dead raise horrifying issues. To begin with, it calls into question what life and death really are. Zombies and vampires are very popular today as creatures haunting us with this blurred distinction. The idea of being “undead” is a haunting but unattractive possibility. Many people like to have their spines titillated at Halloween. 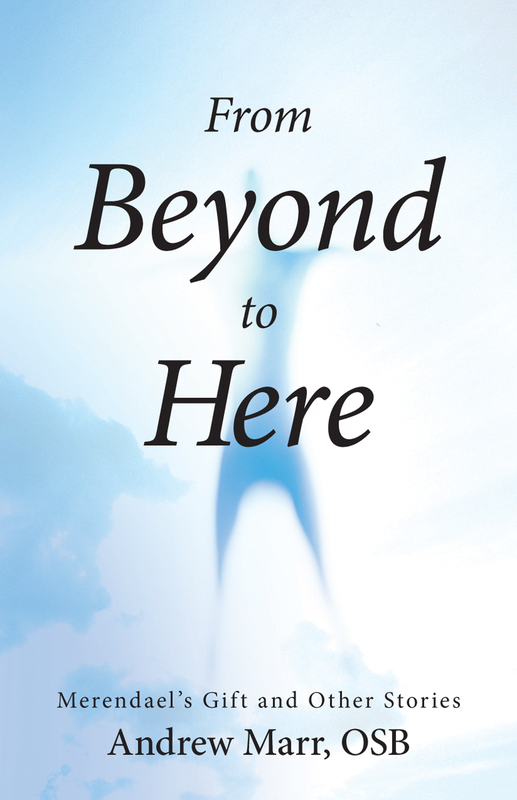 My stories “Ghost of Swiss Castle” and “The Dark Window” in Beyond to Here might chill the spine a little bit, but they also invite the reader to think of lending a ghost a helping hand and receiving some healing in this life as well. The stories of the desert monastics of the fourth and fifth centuries in Egypt are the bedrock of monastic lore that continue to inspire all who attempt to live by monastic spirituality. In one charming story, a monastic who has shared his cave with another, notes that they have never had a quarrel and proposes that they try to have one, like all other people. The other monastic says he doesn’t know how to start a quarrel. The first monastic puts a block of wood on the ground between them and says” “This block is mine. Now you say the same thing.” The second monastic said, “This block is mine.” “No, this block is mine,” insists the first monastic. “Okay, it’s yours,” says the other. And so they failed to have a quarrel. 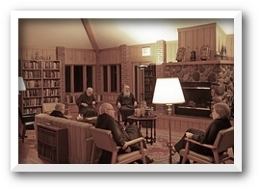 Would these monastics have quarreled if the first had put a gem between them instead of a block of wood? The story about the children and the balloons in “Human See, Human Want,” suggests that question is whether any article at all is given worth by the desire of the other. A block of wood can become as desirable as a gem if somebody else desires it and another person gets caught up in that desire. If these two monastics were not quarreling, what were they doing? The desert literature tells us they would have spent large amounts of time in prayer, much of that in psalmody, and then the rest weaving baskets they would sell to give the money to the poor. That is, they were not focused on each other but were opening themselves to God’s Desire and to the needs of other people. Prayer and helping other people does not guarantee there will be no quarrelling, but the two combined surely help quite a lot. My story “Haunted for a Time” in From Beyond to Here offers a counter-example to these two desert monastics. At the beginning of the story, Murray is so absorbed in his possessiveness of his comic books at the expense of others that he cannot see anything beyond that. Some unsettling apparitions from a ghostly figure challenge him to reconsider his ways. My book Tools for Peace examines Benedict’s teachings on stewardship of material goods in the monastery that build on the insights of this simple story of the two desert monastics who failed to be movers and shakers in the world, but also failed to have a quarrel. Ghost stories fascinated me when I was a child. Slipping into an eerie unknown territory gave me a slightly pleasurable chill in a dose I could take. Although I read ghost stories for pleasure, they stretched my world and, more importantly, confronted me with issues of good and evil against a backdrop deeper than the material world. M.R. James’ “Lost Hearts” is a particularly powerful example. As I grew older, I became aware of the psychological insight the best ghost stories called offer, adding depth to the chills they offered. Henry James (no relation to M.R. James) was the great master of this sort of ghost story. The Turn of the Screw is a troubling, masterpiece that inspired a great, if equally troubling, opera by Benjamin Britten. James’ story has inspired an unresolvable debate as to whether the ghosts are real or are projections of the fevered imagination of the governess. Britten’s opera presents them as all-too-real and malevolent. What both the story and the opera show with devastating clarity is that the governess’ rivalry with Quint, whether a real ghost or a figment of her imagination, destroys the boy Miles, as conflicts of this kind always distort one’s sense of reality and destroy vulnerable people caught in the crossfire. Turn of the Screw does not invoke any transcendent dimension beyond the tragedy in either the story or the opera. Some of the ghost stories by Mary Downing Hahn, such as All my Lovely Bad Ones, move in a more redemptive direction. Stories such as those by James and Hahn show us how victims and victimizers can be stuck, seemingly for all eternity, in a destructive relationship unless they are delivered. We experience this stuckness that feels as if it will never end in real life often enough. Approaching the ghost story genre with my religious convictions, I am concerned with the possibilities God holds out to each one of us for all eternity. I am also concerned for how, just as one can do God’s work by helping a troubled person in this life, one might do God’s work by helping a troubled person who is stuck and cannot “move on” without help. An encounter with a ghost can give a fictional character and the reader chills as it does in “Ghost of Swiss Castle” and “The Dark Window” in From Beyond to Here. The Light reaching to us offer salvation can give us much deeper chills.